American Tourister vs Samsonite: Which Suitcase Should You Buy? No matter where you’re going, you’re going to need some type of bag to carry your gear. American Tourister vs Samsonite both make great suitecases, but with one is best? There are dozens of luggage brands out there, all with great quality and tons of room to carry your gear. But it would take forever to compare all the luggage brands at the same time. That’s why it’s best to start with a smaller luggage comparison like we’ve done here with our American Tourister vs Samsonite reviews. Both of these brands make quality gear, with a variety of sizes and styles to choose from. If you want to know which one you should buy, check out our American Tourister luggage vs Samsonite luggage comparisons below. And we’ve even included a handy buying guide to help you decide what to look for in the best luggage. American Tourister vs Samsonite – Who Makes the Best Luggage? 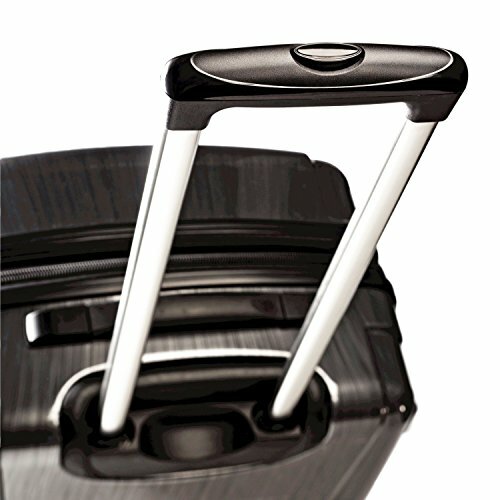 Hardside luggage is like a regular suitcase, but it has a hard shell which protects the belongings inside it. This is the best choice for those who plan to check their bags at the airport since there is no guarantee the baggage handlers would be as careful as you would be. 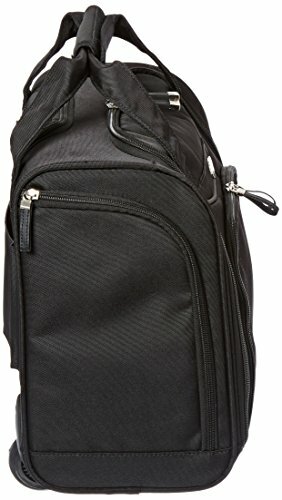 These bags have lots of room inside as well to carry all your clothing, shoes, books, and even your larger electronics, like tablets and laptops. The only downside is that they can’t compress very easily, so you won’t be able to squeeze them down into cramped spaces like softer bags. But the extra security may still make them worth buying. 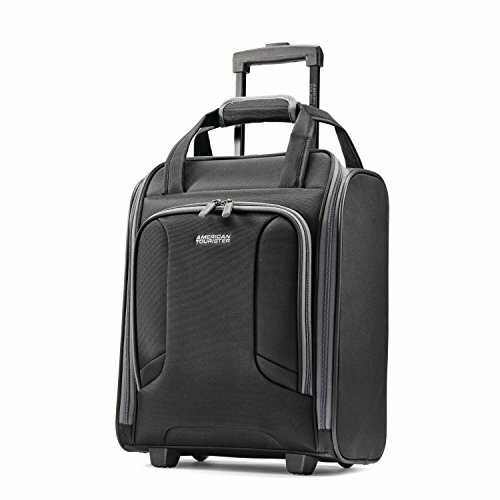 This American Tourister spinner luggage comes in three sizes, all of which are made from strong ABS plastic. 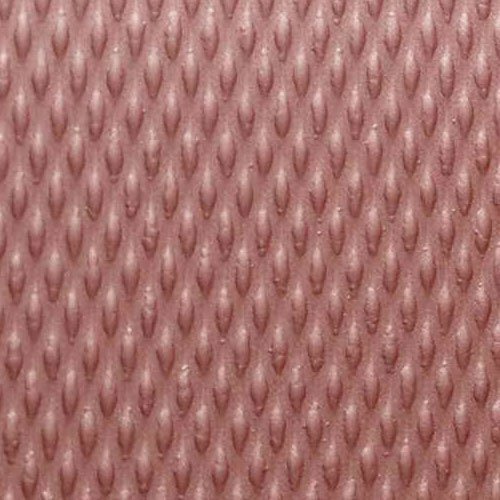 This material resists impacts and high temperatures, plus has a textured finish for a great, classic design. There are four spinner wheels, which spin a full 360 degrees for fast turns and easy movement through even the densest crowds. There is protective housing over the wheels and their attachments to the bag to keep them damage-free, even if you bump them into some corners now and then. 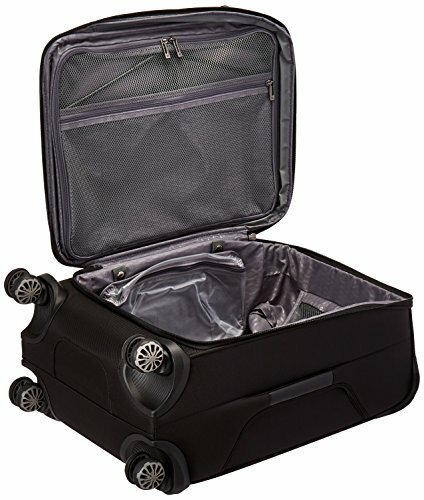 To make it easy to pack your American Tourister spinner luggage, it has a split case design. The bottom section is open, which is best for larger clothing items and bigger pieces of gear. There are compression straps to hold all this gear in place as well, so it won’t wiggle around during your travels. The top section is enclosed by a zippered panel, so you can keep your smaller items separate from your larger stuff. There is also a smaller pocket on the outside of this panel for the smallest items on your list. 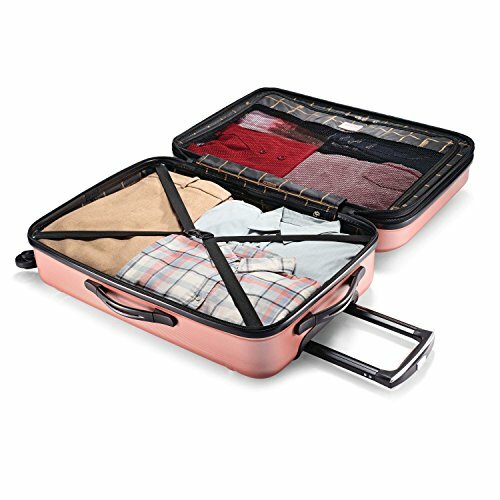 As well as the rugged exterior and handy storage areas, there are some great extra features that make this a hard case to beat when choosing between American Tourister or Samsonite luggage. First, the outer zippers are lockable for extra security. It has a retractable handle with a push-button release, which locks in place whether extended or stored in its handy little storage area out of the way. There is also a top and a side carry handle to make it easy to lift your bag when needed. There is a zipper on the side of these bags, which lets you expand it 1.5 extra inches, giving you a bit more room to store those much-needed items. And these bags all come in a variety of fun colors and patterns, so your bag will stand out from the rest. 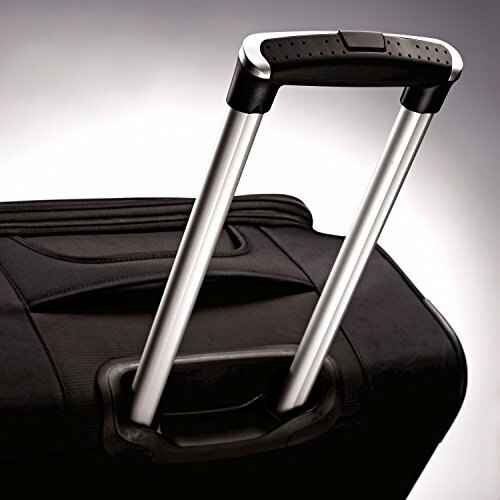 This Samsonite hardside luggage has a shell of injection molded polycarbonate. This material is lightweight, but extremely strong, resisting impacts to keep your delicate belongings inside safe and secure. There is a micro-diamond texture over the surface of the bag, which resists scratching, even on the roughest flights. There are four spinner wheels on the bottom, made of durable plastic material. These are multi-directional spinners, able to move in all direction while carrying the full weight of the packed bag. This keeps the weight off your arms and shoulders while still giving you a full range of movement. And these spinner wheels have been re-designed to be extra light, but still durable enough to handle a bit of rough use. 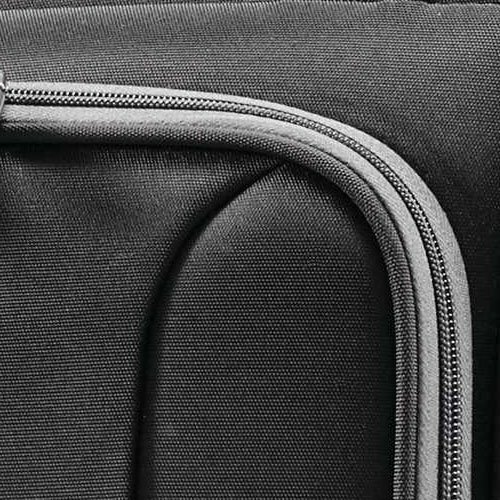 Like the Moonlight hardside bag in our Samsonite vs American Tourister comparison, the Omni PC has a split interior design. The bottom section is large and open, giving you ample space for jeans, sweaters, and coats. There are compression straps to hold all this gear in place during your trip. The top section is best for your smaller items, like small shirts, underwear, and socks, plus any other little items you don’t want mixing with your larger stuff. There is also a small zippered pocket between the two sections for your toiletries and other small necessities. One of the best features of the Samsonite polycarbonate luggage is the TSA lock. This lets you lock the zippers in place to keep thieves out but still allows airline officials access if needed. And there are five stylish colors to choose from. There is a push-button aluminum handle which has multiple stages for the right height for every user. It is wider than the handles of some other brands, to give you more room on the comfortable grip. There are also retractable side and top handles for extra carry options, but which stick close to the bag when you’re not using them to keep them out of the way rather than catching on everything nearby. The next models in our American Tourister vs Samsonite luggage comparisons are the softside suitcases. These come in a few different sizes, all of which have softer materials on the outside to replace the hard shells on the above products. These bags have ample space inside and many of them have some zippered areas on the outside as well for those items you want kept close at hand. Plus, they can be packed a bit fuller since the outside of the bags have a bit more give. This also makes them easier to compress into a smaller space, which can be handy if you’re trying to stuff it in an overhead bin or an already cramped trunk. Though softside bags aren’t quite as secure as hardside luggage, they are still made of quality materials. These American Tourister bags are no exception. The outer material is made of a combination of nylon and polyester. This increases the durability of the bag, giving it extra strength for resisting punctures and tears. There are four multi-directional spinner wheels on the bottom, which are designed for the maximum amount of airflow to increase spinning speed. These wheels spin in every direction possible for easy turning, plus they keep the weight of the bag off your arms while you pull it along beside you. Inside the Ilite Max is a large main storage area. This area holds all your clothing, books, and any other large items you need during your trip. Compression straps hold all this gear in place to reduce shifting during your trip. There is a small pocket on the side of this large storage space, which is zippered to keep your small items secure. On the inside of the lid is a small mesh pocket for socks, ties, belts, or other little accessories. There is a larger opaque pocket as well, which is great for shampoos, colognes, or other liquids. This way, if they spill, they won’t ruin the rest of the gear in your suitcase. On the outside of the bag are a couple of panel pockets, which hold the items you need easy access to, like magazines, documents, or anything else you like to have close at hand. There aren’t a lot of extra features to speak of on these American Tourister luggage bags, but there are a few worth noting. There is a push-button retractable handle on top, which can be stored in its own handy storage area when you’re not pulling it along with you. There are also carry handles on the top, bottom, and side for easy lifting. The sides of this bag are expandable, just in case you buy some souvenirs or need to pack that extra sweater. There is an ID slot at the back of the bag to store your information, just in case your bag gets lost on your trip. 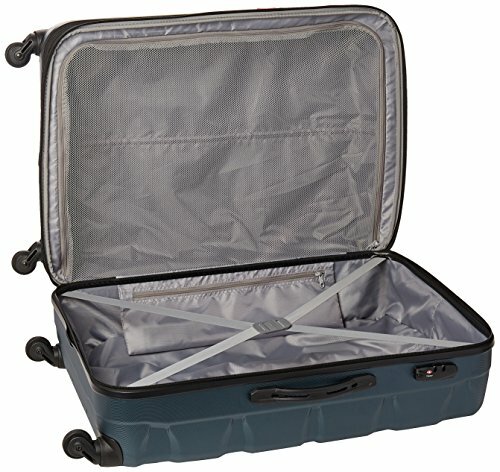 There are four sizes to choose from in this lightweight Samsonite suitcase. It is made of tri-core nylon, which is rugged and durable. This fabric also has a SamGuard water-resistant coating, so your gear will be safe from some light rain or coffee spills. On the bottom of these bags, you’ll find the Tru-Trac wheel system. This system features four dual wheels, all with a camber instructed design. This keeps the wheels rolling straight every time, reducing the amount of steering you need to do. Like the American Tourister softside in our Samsonite or American Tourister comparison, the Silhouette XV has a large main compartment for storing your largest items, plus some compression straps to hold it all in place. This gives you all the space you need for your regular clothing. For the fancier items, there is a suiter compartment in the lid, which you can use to hang your folded shirts, jackets, pants, and dresses. There is also a pocket on the lid for smaller items, plus a wet-pak pocket on the side of the main area for any liquids you need to bring. This will keep any spills confined to this pocket, keeping the rest of your gear unsoiled. On the front of the bag are a couple of panel pockets, which gives you the space you need for your important papers or some reading material during your flight. 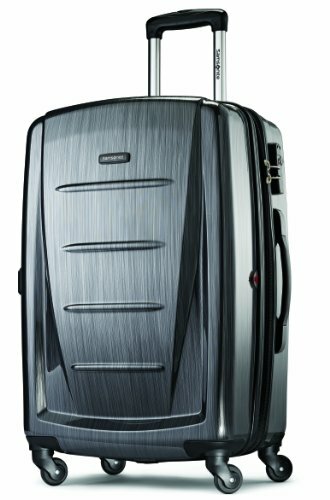 You’ll also notice Samsonite Silhouette XV has a few more features than the American Tourister Ilite Max. There is the RightHeight Pull Handle system, which lets you position the handle at the perfect height for you. This pull handle also has deluxe cushioning and soft rubber seals, giving you a more comfortable grip while you pull it alongside you. The larger two sizes also have TSA combination locks, which secures your bag during your trip while still allowing easy access for airline officials. 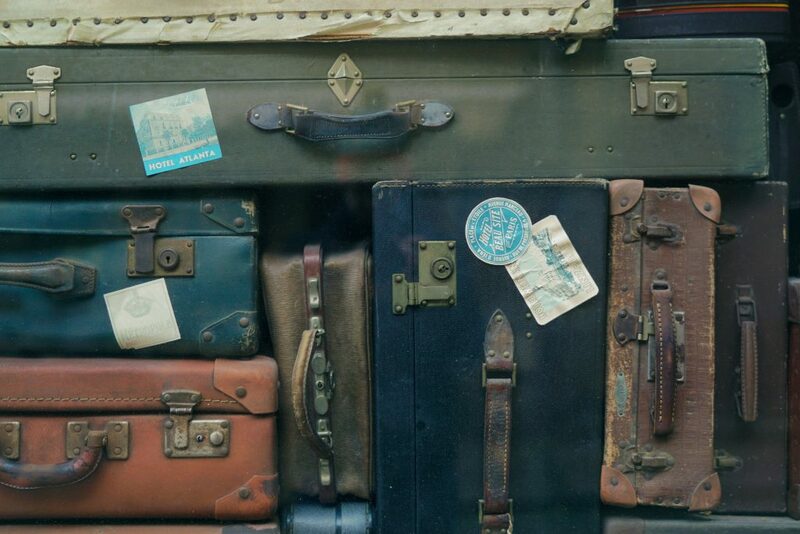 When checking out Samsonite vs American Tourister luggage, don’t forget about carry ons. These little bags are a necessity for air travel. They give you the room needed for all your documents, electronics, plus a change of clothing and some toiletries, which may come in handy if your other bags go missing before you reach your destination. 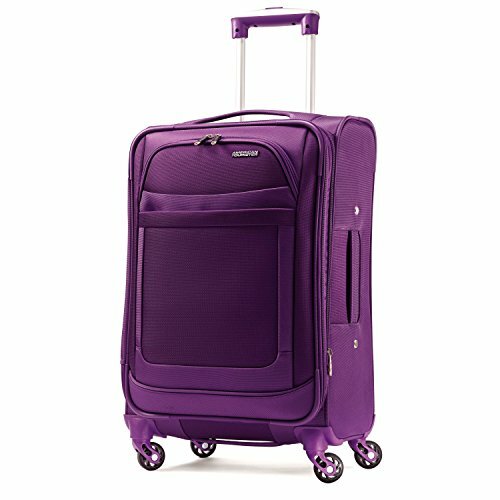 Many of the best carry on luggage brands even add some wheels and a pull handle for easy maneuvering through a busy airport. 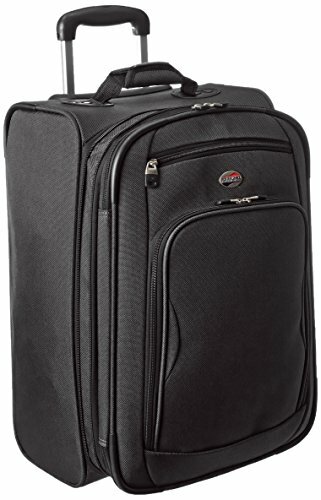 This small American Tourister 21 inch carry on bag is made of 1200D polyester. 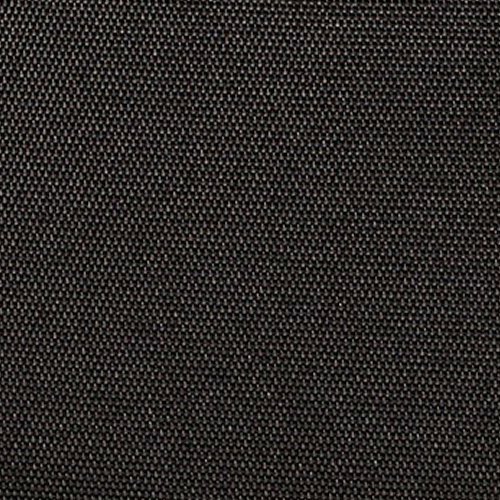 This material is durable and strong, able to withstand a bit of rugged handling when pulling behind you through the airport or squeezing it into an overhead bin. There are two inline skate wheels at the back of the bag. These are made of polyurethane, with ball bearings inside to reduce friction and resistance as the wheels roll. These wheels are tough enough to withstand some bumps along the way. There is also some protective housing around these wheels to give them a bit of extra protection. There is a large main compartment in the Splash 2, which gives you all the room you need to store some extra clothes, a sweater, some books, and even a laptop or tablet if needed. There are also some compression straps in there to keep everything secured in place. On the inside of the lid is a mesh pocket for smaller items you want organized in your bag. There is also an opaque pocket for the belongings you may not want to be displayed to the rest of the airport. 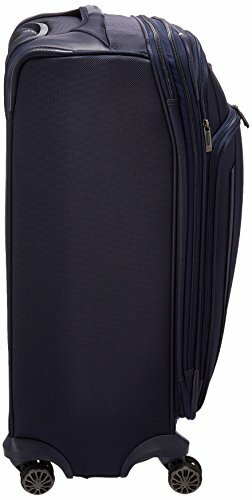 On the exterior front of this American Tourister carry on are two large panel pockets. These are handy for carrying your tickets, some reading material, a jacket, or anything else you may want quick access to. Carry ons are simple pieces of luggage, so there aren’t that many extras. This one does have a retractable handle, which locks when it is fully extended and when stored in its little nook at the top of the bag. There are handles at the top and the side, both of which have padded grips on them. At the bottom of the bag is a plastic rest, which keeps your bag upright when you let it go. This also doubles as a handle, making it easier to lift the bag when needed. Near the main zipper is another one, which allows you to expand this bag if you need a bit more room. At the back of the bag is a small ID slot for you to write your information in. This makes it easier to locate your bag if it is misplaced. 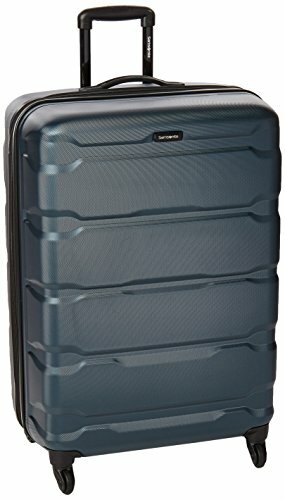 If you prefer a hardside carry on, the Samsonite Winfield 2 Fashion Spinnermay be the best one for you out of these American Tourister vs Samsonite comparisons. Its shell is made of durable polycarbonate, which is lightweight yet extremely strong. It will keep your gear safe from all the bumps it will sustain during your trip without weighing you down. This material also resists scuffs and scratches. There are four spinner wheels on the bottom, which spin a full 360 degrees for easy maneuvering when rushing to catch your flight. And these sturdy wheels have a thick protective housing to reduce damage if you run into someone or something along the way. 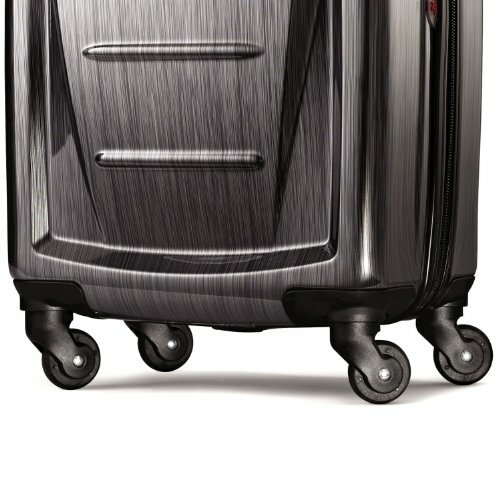 Inside this Samsonite Winfield 2 Fashion carry on there are two compartments, one on each side of the zipper opening. They are equally sized, though one has compression straps to hold everything in place. The other side has a zippered mesh divider to keep the items stored here separate and organized. The divider itself also has a couple of mesh pockets for little gear like notebooks, tablets, or just some socks. When you travel, you want your gear to be secure. 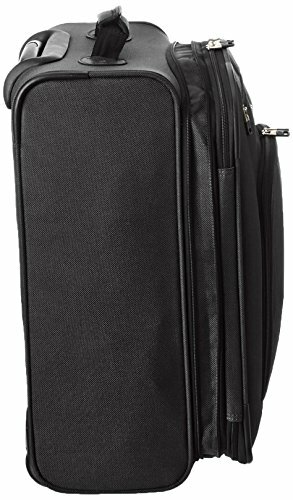 Luckily, this hardside carry on bag has a TSA combination lock to keep out potential thieves, while still giving TSA agents full access when needed. The retractable handle locks in place when it is fully extended or when its stored, keeping it exactly where you want it. 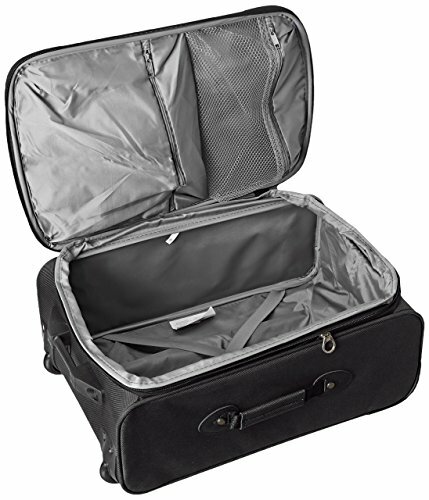 Travel totes are similar to carry on bags, due to their small size. 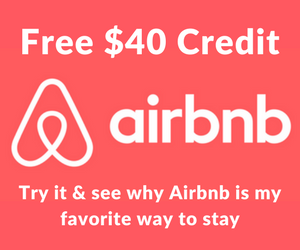 They have enough room to bring what you need for trips that last only a day or two, eliminating the need for other luggage. They also have large main storage compartments, plus some organizational pockets for smaller items on your list. The two in our American Tourister or Samsonite luggage comparisons below even have wheels and handles for added convenience. And they are small enough to fit under most airline seats or in overhead bins to keep them close at all times, which means no waiting at baggage claim. The American Tourister rolling tote is made of durable nylon material that withstands all the rigors of travel. It won’t wear out after a couple of uses, so it is well worth the price. There are two inline skate wheels at the back of the bag, which are constructed of polyurethane. Inside these wheels are ball bearings, which reduce friction and resistance, giving you a much smoother roll. These wheels are pretty strong, able to withstand all types of rough surfaces. There are a couple of nubs in front of the wheels as well, which keeps it balanced and upright, so the bag won’t fall over or rest on the dirty ground. There is one large main compartment, with a large U-shaped opening for easy access to your gear. This space is big enough to hold everything you’ll need for a day or two, including clothing, toiletries, snacks, and drinks. Color pop compression straps hold everything in place. There is a large mesh zippered pocket inside the lid as well for easy organization. On the exterior front of the bag is another large panel pocket, which is perfect for any travel documents, paperwork, or other necessary items you want quick access to during your trip. Rolling totes are small and simple, but they still have a few extras. This one has a push-button retractable handle to go with the inline skate wheels. This handle locks when stored and when fully extended, keeping it secure and reducing the risk of damage. There are a couple of carry handles on the top, which have a padded handle wrap that snaps closed around those handles to keep them together. This also creates an extra barrier over the zipper since it needs to be unsnapped again to open the bag. On the back of the bag is an add-a-bag sleeve, so you can slide this one over the handle of a larger bag for easy toting. 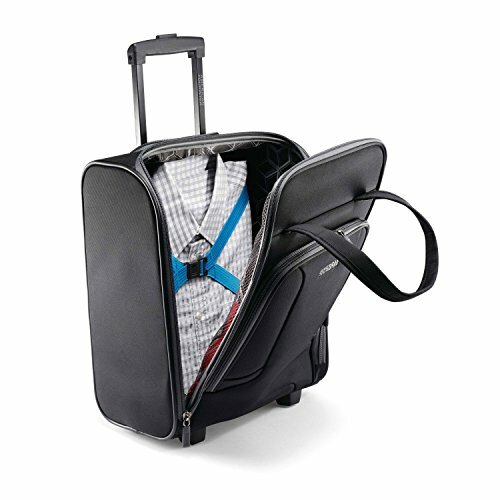 The Samsonite Wheeled Underseater is made of a combination of polyester and nylon materials. The thick 900D yarn makes it extra strong so it is able to withstand a great deal of wear-and-tear, even for those who spend a lot of time traveling. On the bottom of the bag are two inline skate wheels, made of polyurethane and filled with ball bearings for smooth rolling and less friction and resistance. There are a couple of plastic nubs on the front of the bag’s bottom as well, to keep it standing upright instead of toppling over when you let it go. 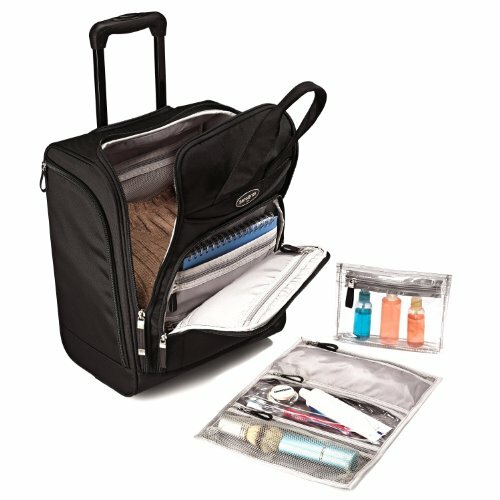 When it comes to organization, this bag wins out in our Samsonite or American Tourister tote comparison. First, there is a large main compartment for a change of clothing and a few other large items. Then there are multiple storage pockets inside, including mesh, Wetpak, and opaque pockets to sort your little items accordingly. For added convenience, there is a 3-1-1 pocket that can be taken right out of the bag and into the bathroom with you when you reach your destination. There is also a hanging organizer pouch included that can be stored in the bag and taken out as needed. On the front of this rolling tote is another storage area. It has a slip pocket, plus a few zippered pockets for notebooks, phones, cords, and your important travel documents. And on the side of the bag is a handy zippered bottle pocket to keep you hydrated during your trip. The push-button retractable handle is lockable, securing in place while it is extended to keep it from shifting while you walk. It also locks when stored in its little storage area to reduce damage when you’re not using it. There are a couple of carry handles on the top of the bag, which can be secured together for easy carrying. Plus, they cover the lid of the bag, making it harder for thieves to slip into your bag. American Tourister has its roots in Providence, Rhode Island. In 1933, Sol Koffler spent his life savings to start his own luggage company to fulfill his dream of creating tough suitcases that sold for only a dollar. Though these days the luggage this company produces costs quite a bit more, they are still one of the biggest luggage companies in the world. They still believe in value and quality, giving you a variety of bags to choose from to meet all your travel needs. Samsonite has been in business for over 100 years. They are a world leader in the luggage industry, thanks to their high-quality luggage, travel bags, and all the accessories that go with them. 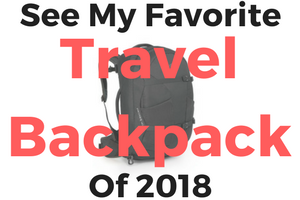 But not only do their bag look good, they are durable enough to withstand the rigors of travel, even for those who spend their lives on the road. When you’re comparing American Tourister luggage vs Samsonite luggage, there are a few things to consider. First, you need to figure out the size of the luggage you’ll need. 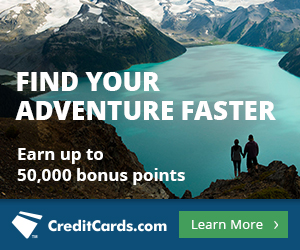 Are you going for only a night or two, or will you need enough gear for an extended stay? Another thing to think about is how you’ll be traveling. If you’re going by car, you can pick any type of luggage that will fit in your vehicle. But there are size and weight restrictions when traveling by air, so you need to plan accordingly if this is your preferred way to travel. There are a lot more different luggage types than you may realize. There are the larger suitcases, with either soft or hard shells. There are smaller carry on bags and travel totes for shorter trips or extra clothing when needed. Duffel bags are huge and soft, making them a great choice for extended stays anywhere you go. There are also laptop bags, though these are only handy for those who need their electronics with them wherever they go. 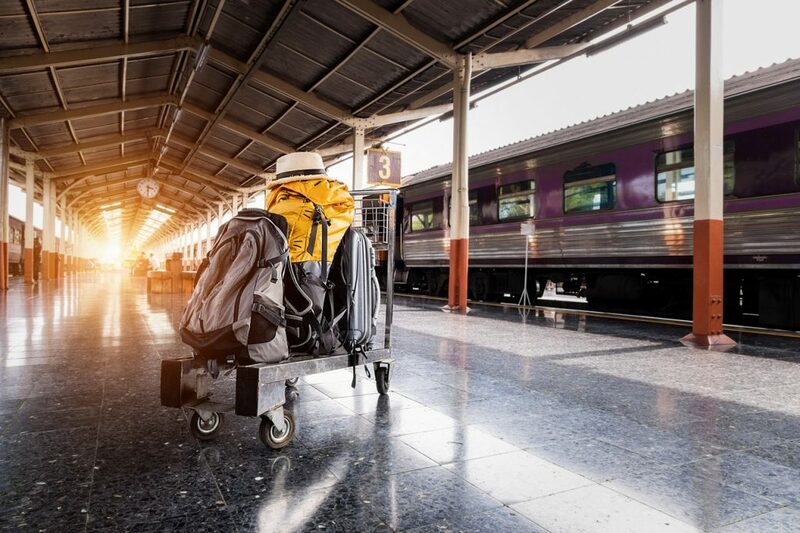 Backpacks can replace carry ons or travel totes in some cases, but most people leave them for hikers and backpackers instead of regular travels. You may have noticed in our American Tourister vs Samsonite reviews that the first two categories of hard and softside luggage came in a few different sizes. These two types of bags are also called checked bags. Depending on the size you choose, they have enough room to store enough clothing, toiletries, and other gear for a few days to well over a week. But they can’t be brought into the plane with you, they must be checked instead. A carry on is a smaller bag. These usually don’t go much larger than 21 inches since they need to fit into an overhead bin or under a seat. 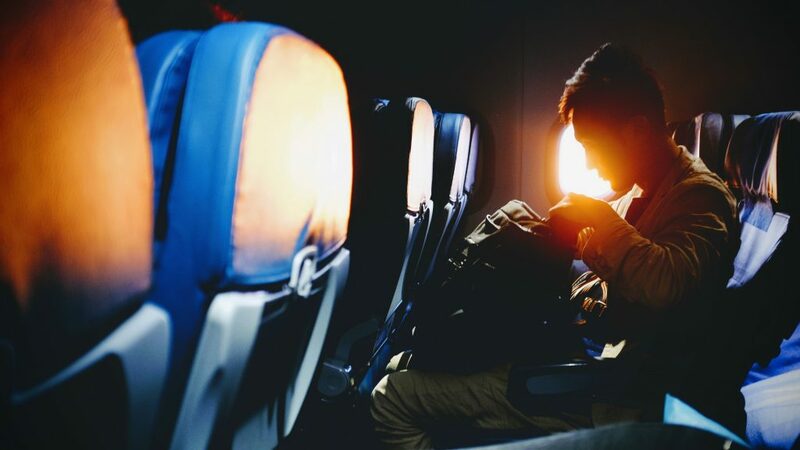 Carry ons don’t have the huge storage compartments found on the larger checked bags, but they can store a change of clothing, a small toiletry bag, and some books, tablets, or other items you’ll want to keep yourself entertained on a long flight. If you’ll only be away for a day or two, you may be able to use the carry on for all your gear, which will eliminate those extra checked bag fees and the long waits at baggage claim. 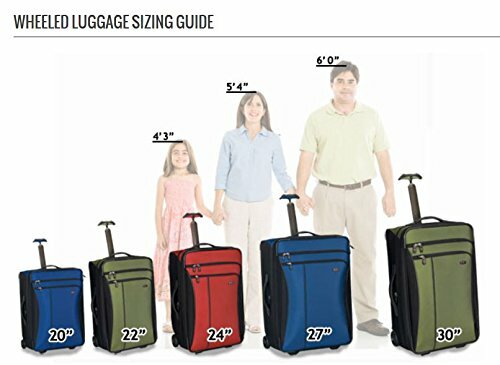 The weight of your luggage is pretty important, especially for air travel. If a bag is heavy when it’s empty, it will be that much heavier when you have it filled with all your clothes and essential gear for your next trip. 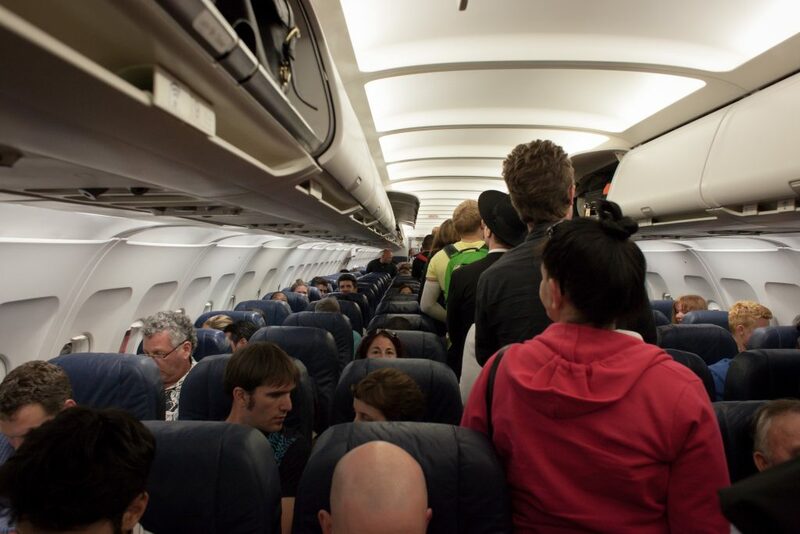 This may put you over any weight restrictions set by the airline you’re traveling with, which means you’ll have to do some swapping in the airport or leave a few necessities behind. You should also consider that you’re the one carrying or pulling this bag. The heavier it is, the more weight there will be on your arms and shoulders. So, it is in your best interest to find the lightest bag you can, without sacrificing on size. In our American Tourister vs Samsonite carry on bag reviews, you may have noticed that the Splash 2 was a rolling two-wheeled bag, while the Winfield 2 Fashion HS was a spinner bag with four wheels. Well, a rolling bag has only the two wheels on the back, which means you need to pull it behind you. This could put a bit of strain on your arm and shoulder, especially if you have it filled to capacity. But the wheels on these bags are a bit sturdier over rougher surfaces, so they roll better on cobbles or uneven sidewalks. They also handle stairs much easier than a spinner bag would. 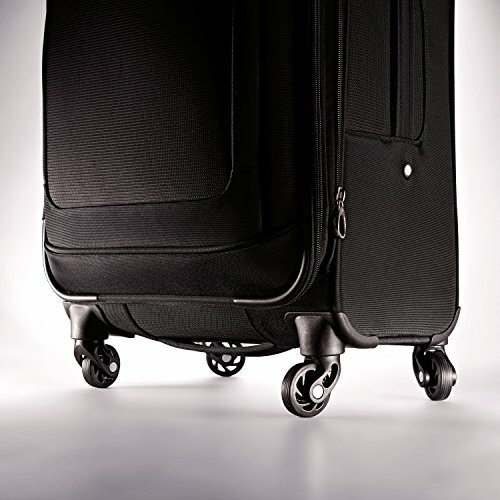 Because they have four wheels, a spinner bag rolls on its own beside you, so there is less body strain. You just have to guide it along. These bags also turn quite well, even around sharp corners. They can be rolled in any direction, so you can even slip them down a narrow airplane aisle with ease. But they are not great on rough surfaces and will need to be carried up any stairs. In our large American Tourister vs Samsonite luggage comparisons, there were hardside and softside bags to check out. Both have their strengths and their weaknesses. Hardside bags are durable and strong, able to withstand bumps and dings. They can’t be punctured or broken, so everything you carry with you will be safe from harm. The downside is that these bags can’t change their shape in any way, so if it is an inch too big for the space you have in your trunk or on an airline, you won’t be able to squeeze it in. This also means you won’t be able to stuff that extra sweater in because the sides won’t be able to expand like fabric would. Softside bags are compressible, fitting into tight areas and giving you a bit of stretch when you need it. But though the fabric used on these types of bags is quite strong, it won’t protect any of the gear inside it from getting crushed. This means your devices won’t have the protection they need if your bag is dropped or another bag is placed on top of it. Pretty much every bag we reviewed in our American Tourister vs Samsonite comparisons above has carry handles on the top. Some of them also have side and bottom handles, which come in handy when you need to lift it into a trunk, an overhead bin, or just onto your bed to pack it up. Then there are the specially designed handles on wheeled bags. These are retractable, many of them locking in place so they aren’t constantly shifting around as you walk. And the best luggage brands even give these handles their own storage area, keeping them out of the way when you don’t need them, reducing the risk of damage. There is no point in buying a piece of luggage that isn’t going to last, otherwise, you’ll be spending twice as much to replace it after only a few uses. That’s why you need to make sure your bag is made of quality materials. For hardside bags, polycarbonate, aluminum, polypropylene, or ABS are the best materials available. All of them are durable and strong, plus they are lightweight materials that won’t add extra pounds to your overall weight. Softside bags usually use nylon or polyester. The nylon comes in a few types, including regular, ripstop, ballistic, or Cordura. All of these synthetic materials are strong, but the ripstop won’t let tears spread. Ballistic and Cordura are both resistant to tears or abrasions. You can also choose polyester, which is cheaper than nylon, but still quite durable and able to withstand some rough treatment. 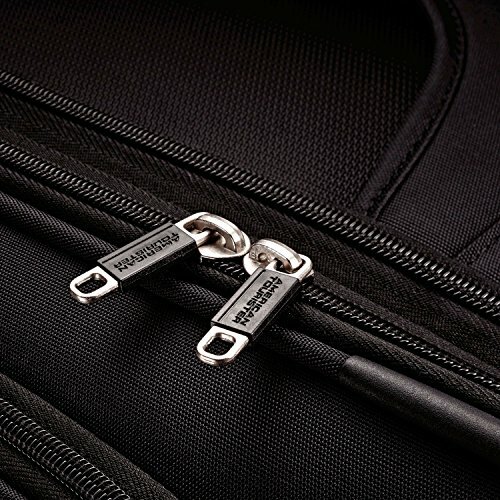 Luggage comes with a variety of neat features, as you may have noticed in our American Tourister vs Samsonite reviews. First, many of them are lockable, keeping thieves from getting into your bag if you happen to turn your back for a minute. Some of them have compression straps inside, to hold all your gear in place so it is still as organized when you reach your destination as it was when you packed it. 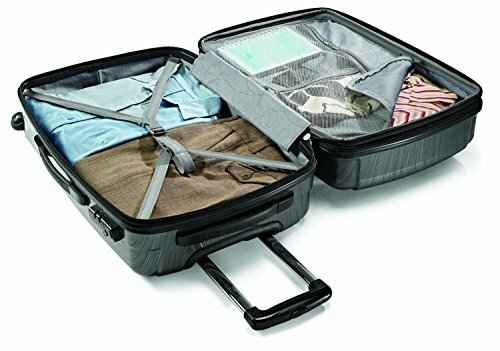 Many checked and carry on bags have a separate zipper next to the compartment zipper that allows you to expand the bag if you need an extra inch or two for a few extra items. An ID slot lets you put your information right on the bag in case it gets lost. As for storage, all the bags on our list have large main compartments. They could be one large area or split into two like our hardside bags showed. Along with the large storage areas, there is usually at least one small pocket inside, plus a few on the outside. 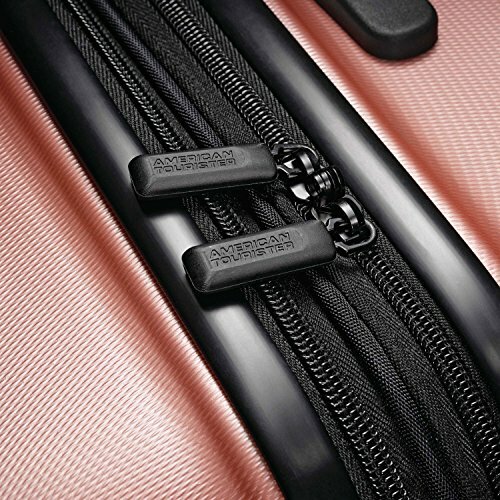 And if you’re lucky, you’ll have some removable pouches like those in the Samsonite Wheeled Underseater bag. When it comes to warranty, most brands cover manufacturer’s defects. Some have limited warranties that only cover these issues for a few years while others have lifetime warranties for these types of problems. The American Tourister warranty is a lifetime warranty and covers any manufacturing defects in either the workmanship or the materials. The product will be fixed or replaced at the company’s discretion. The Samsonite warranty policy is also a lifetime warranty and covers manufacturing defects in both the material and the workmanship. Samsonite will fix or replace the product, at their discretion, for the lifetime of the first purchaser. When you’re traveling, you don’t want to carry some ratty old bag with you, or you’ll be too embarrassed to even pack it for your next trip. That’s why most luggage manufacturers add a bit of style to their bags. They make them sleek and fashionable, so you’ll look better just carrying them around with you. As for color, there is a wide range to choose from. These can be darker, more subtle colors like black, blue, or green. Then there are brighter purples, pinks, and yellows for those who like a bit of flash. There are even some bags, like those in the American Tourister Moonlight Spinner line, that have cool patterns that stand out from the crowd. When checking out the bags in our American Tourister vs Samsonite comparisons, there is one thing to consider. Luggage can be expensive, no matter what brand it is. But the hardside bags are usually a bit more costly than the fabric ones. Then you need to consider the features. Wheels, retractable handles, compression straps, and extra pockets all cost money, and the more of these features the bag has, the higher the price tag will be. But don’t skimp just to save a few bucks, or you may be regretting the limited features you’re stuck with. 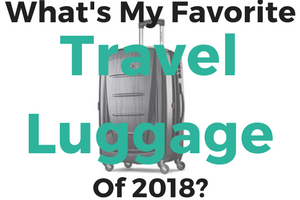 Now that you’ve seen the best of what each brand has to offer in every category, it’s time to decide which brand makes the best bags, American Tourister or Samsonite? Well, first of all, all the bags from American Tourister are cheaper than the competing bag from Samsonite. So, if you’re on a budget, this will probably make your decision for you. But for those looking beyond the price tag, there are a few other things to consider. In our American Tourister vs Samsonite hardside comparison, the Moonlight Spinner is made of ABS plastic, while the Omni PC Spinner uses the more durable polycarbonate. And while the Moonlight has lockable zippers, you need to buy the proper lock for them. The Omni PC has a TSA combination lock right on the bag. For the softside bags, the American Tourister Ilite Max is a decent bag with great features. 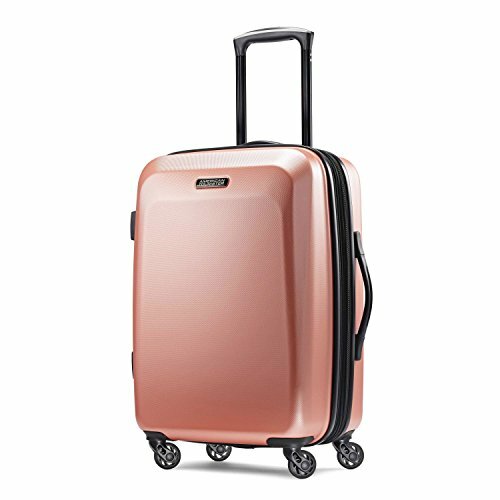 But the Samsonite Silhouette XV has a couple extra sizes, two of which are lockable, plus it has a water-resistant coating for extra protection. As for the carry ons, this one is up to you. 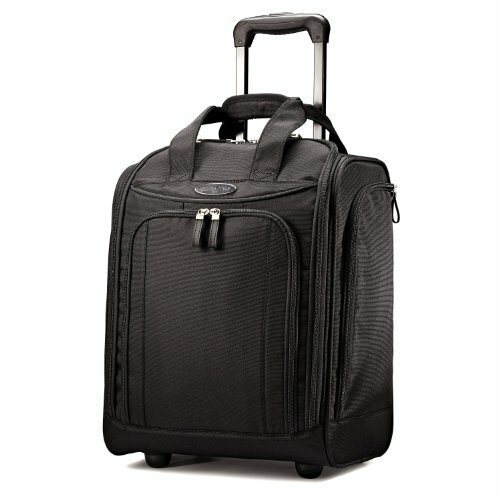 The American Tourister is a rolling softside bag, while the Samsonite Winfield 2 Fashion HS is a hardside spinner bag. If you prefer the extra security, go for the Winfield 2, otherwise take the cheaper Splash 2. The travel totes have an obvious winner, due mainly to the storage options. 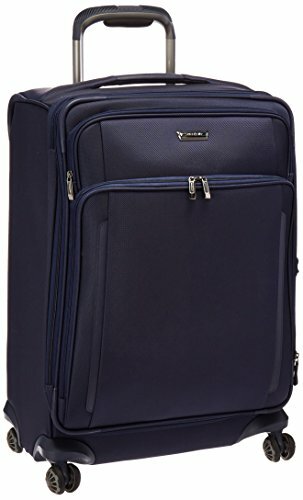 There are quite a few more pockets in the Samsonite Wheeled Underseater, including the side water bottle pockets and the removable pouches, than there are on the American Tourister Rolling Travel Tote. This makes it much more convenient, especially if you like to keep your gear sorted and easy to find.